MONTEREY BAY, Calif. -- Lauren Farms, producer of U. S. Farm-Raised Freshwater Prawns, was recognized as a 2010 “Seafood Champion” by the Seafood Watch program of the Monterey Bay Aquarium in Calif. Recognition was given at the annual “Cooking for Solutions” event to only 8 individuals and companies, recognizing them as leaders that have embraced the message of sustainable seafood and are taking it to new levels. Dolores Fratesi, owner of Lauren Farms, Inc., was a bit surprised to be honored among such prestigious company such as chefs Rick Moonen and John Ash, but excited for the recognition. The annual “Cooking for Solutions” event is a culinary experience and a way to connect what we eat to healthy aquaculture and agriculture. Over 3,000 chefs, media representatives, restaurateurs, researchers, and guests attend the event. This year, Lauren Farms’ Freshwater Prawns were prepared as a ceviche dish by the popular San Francisco restaurant, Tataki Sushi Bar. A Mississippi-based company, Lauren Farms follows the highest sustainability practices in producing freshwater prawns. In doing so, U.S. Freshwater Prawns have been designated a “Best Choice” for consumers by the Seafood Watch program. Owners, Dolores and her husband, Steve Fratesi, are considered role models for sustainable prawn aquaculture. Freshwater prawns are most closely related to lobster and boast a mild, sweet, lobster-like taste which most chefs and ‘foodies’ prefer. Prawns have distinct nutritional qualities, as they are low in fat, calories, iodine, sodium and high in protein and Omega3 fatty acids. 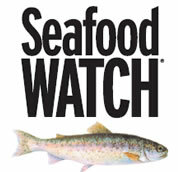 Seafood Watch is committed to preserving our food supply by educating individuals on sustainable products. “Sustainable” foods are those that will be raised in a manner making them available to future generations. For more information on Seafood Watch visit seafoodwatch.org. For more information on Lauren Farms’ Freshwater Prawns, visit laurenfarms.com or call 662-390-3528 today.